WASHINGTON (CNN) -- Secretary of Education Arne Duncan is expected to push for reforms in how teachers are taught when he speaks at Teachers College at Columbia University in New York on Thursday. 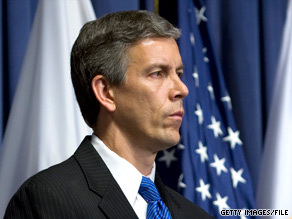 Education Secretary Arne Duncan is expected to say colleges profit from education schools but reinvest little. According to advanced quotes released by the U.S. Department of Education, he will say that "schools, colleges and departments of education are doing a mediocre job of preparing teachers for the realities of the 21st-century classroom." He will call for a "revolutionary" change in teacher preparation programs. Duncan estimates that about 200,000 new teachers will enter U.S. school systems annually. "Schools of education have been renowned for being cash cows for universities," Duncan will say, according to his released remarks. "The large enrollment in education schools and their relatively low overhead have made them profit centers." Duncan will say that universities divert the profits from education schools to other departments while doing little to invest in educational research and clinical training. Duncan has focused on teacher accountability since he took office in January. Under the criteria to receive stimulus money under the Department of Education's Race to the Top program, states that link student achievement data to teacher evaluations will be rewarded. Several states, including California, have removed laws that made such links illegal.